SENASA Registry : SENASA Perú:A.13.19.N.0166. 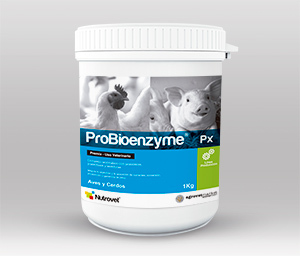 Each 1 g contains: Acid Protease (*) 2800 U, Amylase (*) 45 000 U, - mannanase (*) 23 000 U, Xylanase (*) 192 000 U, -glucanase (*) 46 000 U, Cellulase (*) 6500 U, Pectinase (*) 4800 U, Phytase (*) 1500 U, Inulin 5.50 mg, fructooligosaccharides (FOS) 10 mg, Probiotics (**) 1.05 Billions CFU, excipients 1 g. (*) As enzymatic complex. (**) Probiotics mix: Lactobacillus plantarum, Lactobacillus acidophilus, Lactobacillus rhamnosus, Bacillus subtilis, Bacillus licheniformis, Bifidobacterium longum, Bifidobacterium bifidum, Streptococcus thermophilus, Enterococcus faecium, Aspergillus oryzae, Saccharomyces cerevisiae, Bacillus coagulans. Multienzyme combination of bacterial origin for food based on soy and corn primarily. These enzymes help improve digestion of multiple nutrients in different food ingredients and thereby facilitate their assimilation and decreasing the rate of conversion. Maximizes productivity by improving GIT health. Improves the quality of litter and reduces mortality. 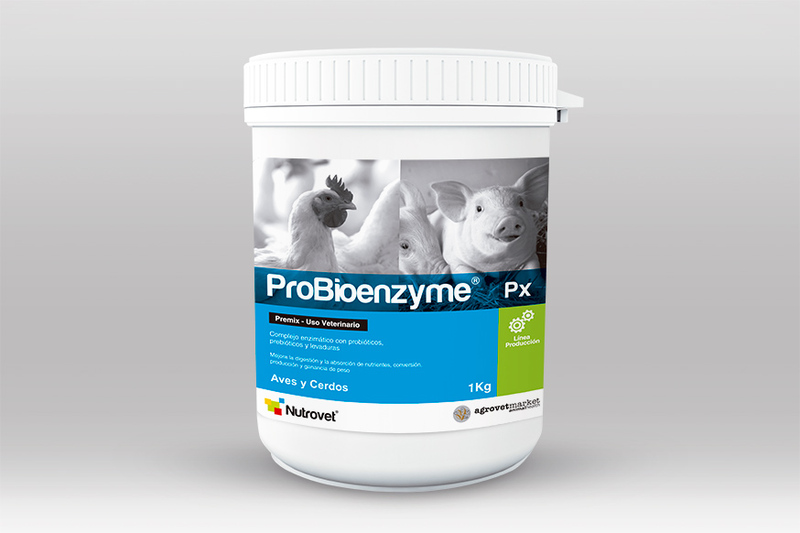 Increases daily weight gain of broilers, egg production of laying hens and breeding birds, increases digestibility, prevents pathogenic bacteria (E. coli, Salmonella spp., etc.) in the GIT and also reduces internal toxins. Chickens: 0.25 to 0.50 Kg/TM of feed. Hens: 0.25 Kg/TM of feed. Pigs: 0.50 Kg/TM of feed.